In the video for "Up We Go," Canadian pop star Lights is on what could be the greatest elevator ride ever. She just doesn't know it. As she sings her latest single, Lights somehow remains sadly unaware of the excitement behind her, ranging from lovers to lucha libre wrestlers. Whether intentional or not, this works as a visual metaphor for where Lights' head was at as she came off her last tour. She was blinded by writer's block and self-doubt, unable to see how exciting her ride was about to get as within a year she'd deliver both a baby, Rocket, and not coincidentally her best album yet, "Little Machines." During a trip back to Toronto – the singer and her husband recently relocated to Mission, B.C. 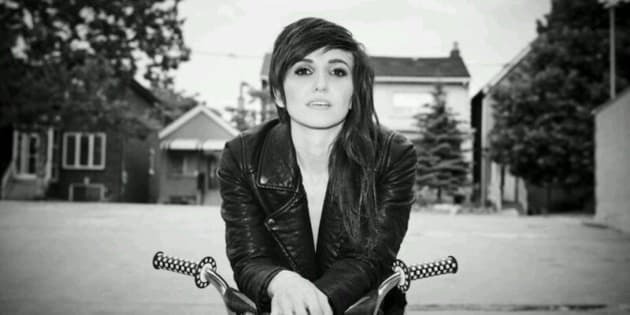 to raise their daughter – Lights opened up about the devastating lows and incredible highs of her past couple years, as well as revealing that she turned her then-pregnant belly into a drum track. So what exactly happened when you started working on "Little Machines." That first song, "Speeding," poured out, it came out in a day, everyone was stoked. All of a sudden that's when it happened. So two summers ago probably that's when it started to go down. I started to feel this pressure. So this is before you were pregnant? I got pregnant last summer, so it was about a year before. And it lasted a long time, that was the problem. My good friends [were like] "This is going to be your time." And I'm, like, nothing is written yet. And then it all goes in your head and it freaks you out. Did finding out you're pregnant break the writer's block? It kinda did. By making it worse. That's the irony of it all. I found out I was pregnant in June last year and it was a nice break from that feeling of frustration. Time went by and I didn't write, and I was just escaping from the fact that I needed to write a new album. So then on top of being very concerned that I lost my knack for writing I was faced with a crossroads, questioning whether I should keep doing music or should I stop. Can I even do music as a mom? I just didn't know. I don't have any personal friends that are touring women that have a baby. I know they exist. I thought about Gwen Stefani. Lots of people had done it but I didn't know anybody. Yeah, there's another one. But copious amounts of money help! So there was a lot of thinking about logistics and can I even do this? That closeness to losing what we all worked for made me remember how much I really loved it. All those amazing memories we had touring and all the songs we put out that have moved people and that reinvigorated my passion for it, and that's what I needed. You need to enjoy what you're doing in order to do something good. You can't force it. So did you do most of the writing when you were pregnant then? In that one year that was kind of blank I ended up writing stuff that I went back to later and it was good; I just couldn't tell that it was good at the time. Which is the ironic part – nothing sounded good to me. I'd listen to the radio it didn't sound good, and I would write something and it wouldn't sound good. Go back to it later and it's like, "oh, there's something there." Then when I was five months pregnant, I took a trip to Earthships and that's when I was really getting my ideas back together. It's in New Mexico, it's this community of off-the-grid homes, very other-worldly. And I brought my solar-powered recording rig and it was awesome. It was funny realizing that all along it was there, you just need the vision to collect it. And so did you do the actual studio recording after she was born? We put the wheels in motion and by January 3rd we were in the studio and I had her February 15th and I finished recording March 3rd. So I had her smack dab in the middle of recording. At this point you're nine months pregnant – did that affect your voice? It was hard to sing. Not because in my throat was affected, but your abdominals. And I didn't realize how much abdominal strength it takes to sing out. On this record I think from the live experience that I've had I wanted to sing out. And as song like "Up We Go" is all at the top of my range. I really had to work a little harder to get the vocals out because of that. After I had her I was back in the studio three days later doing the easier songs, thank god, because I had nothing left. But having worked so hard while I was pregnant my voice is better now than ever. And it's easier for me to sing than ever, and I feel like it had something to do with it. Like I had to overexert myself and over try and I think now I learned something else in the process. The record seems a little darker, especially the opener "Portal." There's some like happy sadness happening. Any particular reason for you to be going in that direction? It's funny that you placed it as dark because the whole time I was writing, I was picturing writing something feel-good but I think I gravitate towards like there's always a minor chord in my songs. Except for "Up We Go." But the content of the album on for the most part is like a positive, feel-good thing. "Portal" would be an exception because that's a piece of poetry I wrote. Has having a kid and seeing how she's reacted to music has affect you? I don't think her reaction has changed anything, as much as I like watching her smile when I play the songs because I play them for her all the time. And she was built when I was writing this album so I think it's, like, in her makeup, when she hears a song she seems to be really happy. But the one thing I have noticed is I feel more confident than I've ever been, I don't know if that's because after childbirth you can do anything. Honestly, it was the hardest thing I ever had to do and after I was like anything goes. I don't sweat the little stuff anymore. The little worries, I just don't have time for them anymore. So you cut the fat and are more chill and because of that every performance is more fun. I sing these songs with confidence that I've never had before. Are any of your songs a particular grabber for her? In the first few months of her life, "Portal" would put her to sleep. And I can't tell if it's sort of like a drone or if it was the fact that the beat in it was me drumming on the baby belly. So that's the beat on that song. Yeah, that's not the whole beat but that's the bulk of the beat. My producer Drew [Pearson] always saw me drumming on my belly. One time he saw me and said we gotta put that in the new song and we put it in "Portal."